In today's blog we take a detailed look at South Africa's crude oil imports from January 2010 to June 2017. Where exactly is South Africa's crude oil imports coming from? Where does it enter South Africa's borders and what is the price paid per kilogram of crude oil per country South Africa imports crude oil from? The pie chart below shows the 10 biggest contributors to South Africa's crude oil imports. Almost 40% of South Africa's crude oil imports comes from Saudi Arabia. 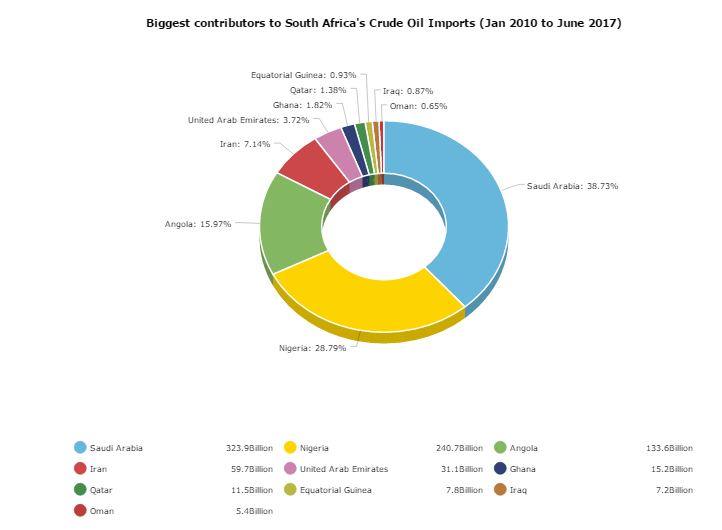 Nigeria is the 2nd biggest contributor to South Africa's crude oil imports, with almost 30% of all of South Africa's crude oil imports coming from Nigeria. In a distant 3rd place is Angola, with almost 16% of South Africa's crude oil coming from Angola. Surprising to see is Iran is South Africa's 4th biggest contributor to crude oil imports (and this with Iran having sanctions imposed on them over very long periods of time from January 2010 to June 2017). One wonders how much bigger Iran's crude oil imports into South Africa would have been if it was not for sanctions imposed against them. The second pie chart we will be looking at is where crude oil imports enters South Africa. The majority of crude oil enters South Africa via shipping vessels, thus the main points of entry is at various harbours in South Africa. As the pie chart above shows the main point of entry for crude oil into South Africa is Durban. And the main reason for that is the fact that there is large crude oil refining capacity in in Durban. Thus the crude oil is dropped off close to where it will be refined to make fuel and jet fuel. Other points of entry is probably only used when Durban harbor is full and ships are rerouted to other ports for processing. Next question that most people ask is which country's crude oil is the cheapest? Well we take a look at the price per kilogram paid by South Africa for crude oil from the various countries it has imported crude oil from since January 2010. Note we took the data as obtained from Customs. Certain classification problems might be contained in the data as it is highly unlikely that South Africa imported crude oil from Germany or Israel for example. We suspect the "crude oil" as coded by customs from Germany might have been motor engine oil. Readers will note that the majority of countries in the list above is either middle eastern countries or central to west African countries. This is due to the fact that the largest oil deposits in the world that is currently being extracted is in the middle east and west African countries. Prices paid per kilogram of crude oil imports from the main crude importing countries seem to be very similar. As there is small differences between Saudi Arabia, Nigeria and Angola for example. The large price variations comes into play from countries such as Germany which we already mentioned we suspect is due to mis classification at SARS's customs office. So what is the average amount of crude oil South Africa imports per month? the following bar chart shows the average amount of crude oil imported per month per year. The bar chart below shows the average monthly value and quantity of crude oil imports into South Africa per year, from 2010 up to June 2017. Interestingly in 2015 South Africa imported a lot of crude per month. Far more than any of the other years, and in 2016 and 2017 so far crude oil imports is at the lowest levels yet. The table below shows the above graphic in table format. The declining imports of crude oil (in terms of number of kilograms from 2014 to current 2017 levels) could point to a few things.